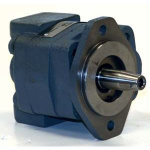 The clutch pump in most hydraulic applications is driven by a belt on a integral pulley, driven by either a gas or diesel engine. When there is no power to the clutch the pump does not engage. But when power is applied to the clutch the pump will engage and provide pressure to the hydraulic system. 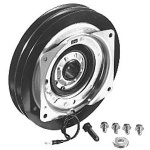 Serpentine Clutch, Rated 120 Ft. Lb.